And we’re all sitting there on the edge of our seats wondering – OK – what does the message say? And they play music and the suspense grows. Hurry up – open the bottle and tell us what it says! 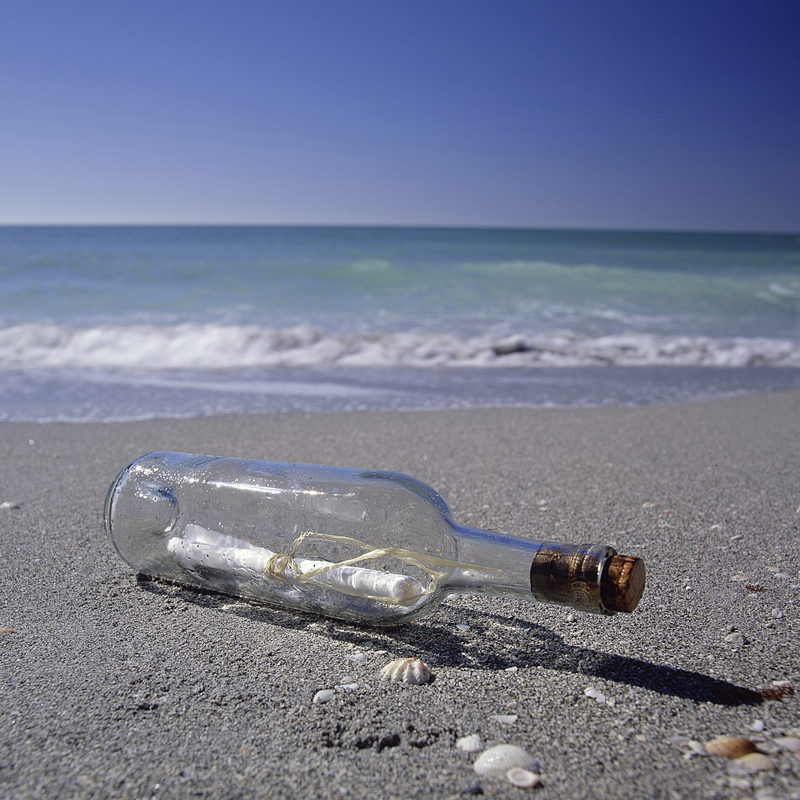 you ignore the bottle – sure there’s a message in the bottle, so what?! you open the bottle and read the message – I wonder what it says? As Bart Simpson would say – DOH! Obviously we’d pounce on the bottle and open it. Who knows how long it’s been in the ocean or where it’s come from or who wrote the message or what it says? I mean, how awesome … a message in a bottle. And what if you opened the bottle and discovered that it was a love letter? A love letter written, in one sense, to anyone – but in another sense, a love letter written specifically to you. Now that would be amazing, wouldn’t it? As long as people have had ink and paper, there have been love letters. I mean, love letters or cards or flowers. They’re a really special way to say “I love you”. They say “I love you” in a way that nothing else does. And anybody who has been through a courtship will probably have the odd love letter tucked away somewhere. There’s one love letter though, that’s more special than any other. God’s Word … the Bible. I want to shake you out of this attitude that the Bible in an optional extra in our walk with God. The Bible is alive. It’s God’s living Word. And when we read it, we need to open it up and say, “Father I believe this is you talking to me today. I believe this is your will for my life. I believe that your Holy Spirit wants to shine your love and your light and your grace and your wisdom into my heart today through the words on this page”. It’s alive. It is the living Word of the living God. It’s that message in a bottle. And it’s His chosen way of speaking with us. Not through some dry, theological text but through real life stories that engage our hearts and captivate us with His awesome love. God has gone to an enormous amount of trouble to preserve His love letter for you and me, here and now, today. That’s why, “I’m just too busy to read the Bible” is so feeble. Do you see how inappropriate that is? No wonder it feels like God is a million miles away! All the time, He just wants to speak His promises into our hearts, whisper His love into our ears, His grace into our lives. And the one principal way that He has chosen to do that is His love letter, the Bible. How can we be too busy? God has brought us near through faith in Jesus Christ. He has set up his home in us through his Holy Spirit. God is with us in every moment of every day, right through the cut and thrust of life. He calls us into an intimate relationship with Him. And God has written a love letter to us. That love letter is called the Bible and He would speak to us every day through His Word, if only we would listen. God is here in this place with you and me. Right here. Come. Come and be close to me. Thank you for your uplifting ministry i enjoy everything Bernie. God continue to uplift him in all his work and bless him abundantly Lord for his faithfulness. Your new blog is thought provoking, I appreciate it, and shall look for more of the same….Bless U in your work!